PhD Comics, 10/3/2003, (c) Jorge Cham. Whenever I’ve heard (or read) people say things like “the more you learn, the more you realize how little you know,” I always used to think it referred to a breadth and depth of detailed knowledge. The more you learn about Japan, the more you realize how little you know about England, the Netherlands, or Korea (not to mention Botswana or Guyana); at the same time, the more you learn about any given aspect of Japanese culture or history (for example), the more you realize just how many other castles, samurai lords, artists, events & incidents, works of literature, or whatever it may be, that you still don’t know about. Plus, even within any given topic, the more you know about Hokusai or Danjûrô or Saga Castle, for example, the more you realize just how much more about that same topic you still don’t know. That’s all certainly true. But, I’ve come to realize there is a whole other dimension to this phenomenon, too. Specifically, as I’ve spent more time in academia, as I’ve learned more and more, and come to appreciate the diversity and complexity inherent in any and every topic, I’ve discovered an inability to speak confidently on almost any subject, or indeed to even think confidently that I properly or sufficiently understand any given topic. 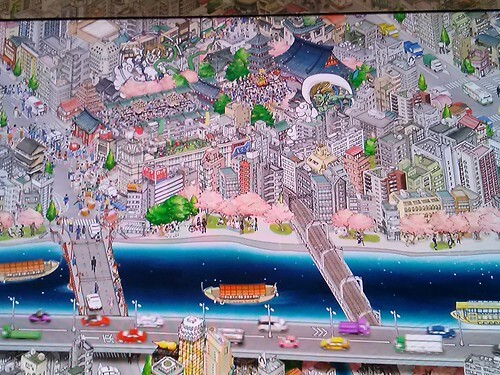 From the “Sumidagawa Digital Picture Scroll” on display at Tokyo Sky Tree. Artist unknown. When I came to Japan for the first time ten years ago, I had all kinds of ideas and impressions about what Japan, or Tokyo, was like, and what Japanese culture or attitudes were like, and I didn’t hesitate to share these in blogs, and in talking to friends and family. At that time, thinking my undergraduate courses & reading made me actually something of an expert, combined with my experience as a study abroad student in Tokyo, which I thought a rather rare and special experience, I saw myself as truly having some kind of expertise, and some ability to speak on a wide variety of subjects pertinent to Japanese culture or history. Of course, the fact that so many of my family and friends asked questions and seemed to think me something of an expert only encouraged this. What do Japanese think about the war? Why did they do it at the time? What do they think about the Emperor? What do they think about Hiroshima? about Pearl Harbor? about Christianity? about Judaism? about the US? Asked these questions, based on my experiences, books, professors’ lectures, and my own personal ideas or impressions which I mistook for possessing some authority, I commented with a considerable degree of confidence on everything from life in Tokyo, contemporary pop culture, and contemporary political attitudes, to attitudes during the war, to aspects of traditional culture or samurai history. 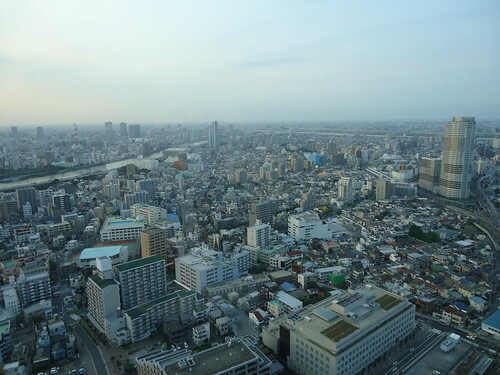 A view of the “real” Tokyo, from that same Tokyo Sky Tree. Yet, today, if you asked me about half these topics, I’d almost definitely say I have no idea. Whether this is simply a function of getting older, or a function of the amount of “knowledge” and experience I’ve accumulated over my many years in graduate school, or whether it has to do with post-modern theory that’s been imposed upon me, I don’t know, but, I have absolutely come to feel a dramatic lack of confidence in my ability to “know” or say anything definitive about almost anything. I used to think my professors and my history books provided definitive answers, and that based on these, and whatever else I’d been exposed to, that I “understood” or “knew,” and could reiterate (or regurgiatate, as if on an exam) a relatively definitive answer. I used to believe that books and professors were perfectly reliable, believable, sources of “facts” which, like pieces of a jigsaw puzzle, or bricks in a building, could be collected, arranged, assembled, to form an increasingly detailed – if never complete – knowledge of a given subject. But today, I’d say that the issue, whatever issue it may be, from military bases in Okinawa to the current economic situation, is far too complex, and that I haven’t done the proper research. I haven’t interviewed or surveyed hundreds of people, and I haven’t scoured through hundreds of texts (or other evidence/sources), so, I don’t know. I can tell you what I think about the issue myself, and I can tell you what a few things I’ve read or heard say about it, but, I have no idea what most people think, or what they really think, or the precise reasoning or thought process behind why they think that… and so, in contrast to when I was younger, recognizing or acknowledging the limitations of my knowledge, I generally would hesitate to say anything much at all on the subject. 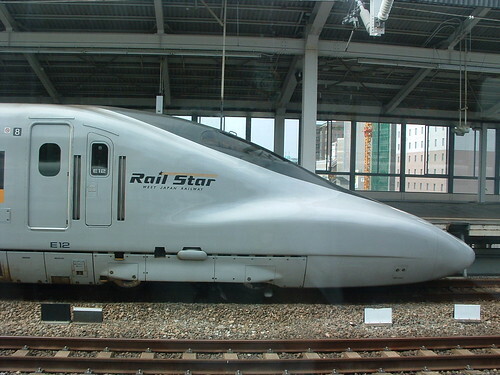 A Hikari Shinkansen locomotive, at Hiroshima Station. Taken in August 2003. Just because I’ve grown used to something, just because the novelty has worn off, does that mean I’m now seeing it more truthfully? Does that mean I’ve “realized” the “truth” about it? Does it make my new experiences any more genuine than my old ones? My first time in Japan, I was amazed by the Suica card system, by the Shinkansen (so fast, so clean, such a smooth ride, and so convenient, if a bit expensive), by how clean and completely non-sketchy the convenience stores were, by how perfectly on-time the trains were and how organized and polite most people were in most situations. I had a cellphone for the first time, and, of course I was amazed too by the technological capabilities of the toilet seats. Japan seemed at that time so sparkly shiny wonderful, so futuristic, and so wonderfully civilized. More so than [my experiences of] the US, in so many ways. But, now that I’m used to these things, and they’ve lost their novelty, now that I see supercrowded trains not as a sign of how vibrant and active and urban Tokyo is, but instead as an obnoxious product of overcrowding and of the negative sides of urbanization – now that I see a train ride in Tokyo as an ordeal rather than an adventure – does that mean my new view is any more correct? Or that Tokyo or Japan has in any way genuinely declined, stagnated, or gotten further twisted up in inefficient and stupid bureaucracy in the intervening ten years? I don’t know. 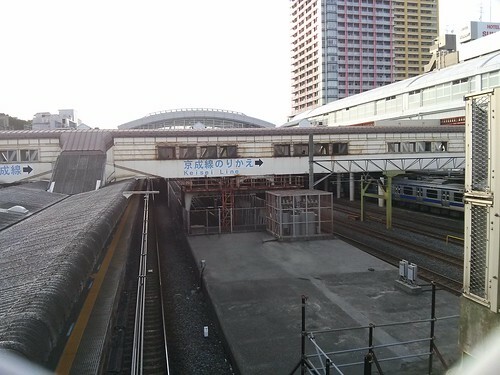 Nishi-Nippori Station, in northeastern central Tokyo. Is this the “real” Tokyo, and the flashiness of Shibuya merely a front? Or is Shibuya the “real” Japan, and this a sort of left-over from an earlier decade, that simply hasn’t quite caught up yet to the “real” Japan of today? If I’ve seen more delayed trains in the last two days than ever before in my quite limited experience in Japan, if I’ve seen more train stations served by far too few trains (coming far too infrequently) and surrounded not by an exciting, intriguing, or “quaint” or attractive town, but instead by nothing but asphalt, concrete, pachinko parlors and rundown hotels, is that an indication of the “real” Japan? Or of a decline? Or is it just an accident of where I’ve been, and when I’ve been there? Which is the exception, and which is the normal? It is in these ways, and for these reasons, that I increasingly feel totally incapable of saying anything with any kind of authority about Japan, whether it’s a scholarly comment or even just something to write down in my journal. While I certainly understand why making such gross generalizations would be inappropriate – I’ve read and talked about Edward Said’s Orientalism more than enough – at the same time, it’s kind of sad, and leaves me feeling kind of empty. Looking out over the landscape, or reflecting upon my experience, I want to be able to think something about it; I want to be able to consider it and analyze it and feel I’ve come away having learned something or gained something or realized something. But, instead, I just stare blankly, unable to think anything at all without simultaneously thinking that that thought is too generalizing, too biased, too based on insufficient information or insufficient consideration. What is the purpose, after all, of reflecting upon my experiences or impressions, when these are so completely subjective, results not only of my individual personality and perspective, but also of my mood that day, and of all kinds of accidental factors, e.g. that I went to this shop rather than that shop, or this town rather than that town, or that I got there an hour earlier or an hour later, or a day earlier or a day later? For certain types of things, I still believe in the value of “facts,” of building up one’s knowledge of what’s already “known” (or, rather, what’s already said) about a given subject, and of adding to that collective “knowledge” through one’s own investigations (research, e.g. reading texts). But for other things, it’s sometimes very much a feeling that we don’t know, we can’t know, we cannot, will not, every know. Which leads to the next question: if none of us can truly call ourselves experts, if none of us can ever truly obtain anything approaching or resembling expert knowledge, if “knowing” X or Y is impossible, then, as scholars, what the hell are we doing? I feel exactly the same way. When I studied abroad, I thought I was such an expert on Japanese life. Living there for four years post-MA, I started to understand Every Situation is Different, especially with city vs rural life (and that’s only in my neck of the woods, not other prefectures); how expats in Tokyo experience life very differently than expats in the Noto; how different the regions’ customs and attitudes are. All this, especially after having to explain how diverse the US is and that my personal experience is only one tiny, tiny part of the American experience (while encouraging everyone to look for and appreciate Japan’s diversity). Fantastic post. Thanks :) I think it’s terribly rambly, but, I’m glad the core idea came across well. As I rode the train from Yokohama, through Tokyo, out to Chiba, past bucolic* areas full of wooded mountains and green fields/grass, thinking about how wonderful it might be to finally experience the Japanese countryside, and then pulled into a not-so-bucolic station, surrounded by concrete, asphalt, pachinko parlors, a single, lonely 7-11, and just one somewhat rundown-looking hotel, I just had all these thoughts, you know, about what Japan is like, which of these places I passed through on that day were the “real” Japan, etc etc… and so many thoughts I felt I could no longer really follow through on thinking, let alone to say/write down. Speaking of writing about culture and humility, check out Toranosuke’s excellent piece on the moment when you realize you how much you don’t know about your field over on A Man with Tea. I’ve never been to Japan, so I can’t really say anything about that. But the feeling that I don’t know enough to have an opinion, is a feeling I know well – and don’t like it. So it’s nice to read a post of someone who also knows this feeling. Another one of your thoughtful and heartfelt posts on something I think everyone in the humanities and social sciences has felt at some time or another. It certainly shows humility, which is a good trait to have as a scholar. Whenever I feel uncertain about making a pronouncement on something I’m studying, I always find it inspiring to read one of my all-time heroes on the subject, Wilhelm Dilthey. Despite all of the intervening years since he wrote, I think he came closest to articulating–and solving–the dilemma of securing reliable knowledge in the humanities and social sciences (what he called the “human sciences”). In essence, Dilthey thought that the natural and human sciences had different methods of attaining knowledge. The natural sciences seek to explain. The human sciences, on the other hand, seek to *understand*. So each requires its own method of inquiry. In order to explain a natural phenomenon, the natural sciences investigate. In order to understand a human phenomenon, the human sciences *interpret*. As soon as we talk about interpretation we are suddenly leaving the world of objective scientific truth and enter the world of “argument,” “plausibility,” and “persuasiveness.” We measure the worth of an interpretation on how plausible it seems. How much it follows from the available evidence coupled with our general knowledge of the subject matter and…the world at large. We may never have absolute certainty about the meaning of human phenomenon. But we can–certainly–have “more or less” certainty. And isn’t that enough in the messy world of human affairs? Based on what we know–finite, limited creatures that we are–we can nonetheless use our intuition and experience to puzzle over the meaning of something and then marshal the best arguments at hand based on the best evidence available to try to persuade, cajole, inveigle, and otherwise use any and every means possible to try to convince our fellow friends that our interpretation has the ring of truth. “Intuition and experience.” When we talk about interpreting something, we are talking about using our powers of human understanding. How do we understand human phenomenon? We draw on our own lived experience in the world, for one. The more we have first-hand experience of the world around us, the greater our capacity to understand human phenomenon in general, regardless of time or place. Here then is the first factor in what makes an interpretation more or less plausible. We also draw on everything we know about the world of the subject we are interpreting. In this connection, I think of Ivan Morris’s “World of the Shining Prince.” Morris took a thorough look at Genji’s world in its totality. By understanding the totality of Genji’s world, he is in a position to give very plausible interpretations of the meaning of The Tale of Genji. So the more we know about the “world” of the subject we are interpreting, the more confidence we can have that our interpretation does justice to it. “Does justice.” For the phantoms of history are in desperate need for us to do right by them. It’s the only way they can be brought to life again to live in the manner to which they are accustomed. It also means we have the capacity to do violence to them, to misrepresent them, to slander them. We are charged with a heavy responsibility to represent these phantoms. Judging whether justice is served is the same process in academia as in the courtroom. We must make our case as best we can, try to defend our representations of these phantoms to the best of our ability. A jury of our peers will judge whether our efforts are just or not. So doing more or less justice to the subject, having more or less confidence in our interpretation, these may be enough of a measure of truth in the human sciences. It may be enough to satisfy and sustain ourselves in our work. Certainly arguing and trying to persuade our friends that something is likely true is one of the more enjoyable aspects of scholarship. If the absolute truth of everything was knowable, what fun would that be? What work would it leave us? The Buddha may very well have been right that much of what we see around us is an illusion. But that doesn’t mean that there isn’t a true reality somewhere. It doesn’t mean we don’t have access to the truth, if we have the “eyes” to see. It doesn’t mean we can’t divine the truth, even if it’s more or less dimly. In fact, there can be no concept of illusion without the concept of reality. So illusion/reality and objective/subjective truth are in themselves false dichotomies, mere illusion in the face of a greater reality that we inhabit. This is as much true in the academic realm as much as the spiritual. Wow. My sincere apologies for not saying so half a year ago, but thank you for this lengthy and thoughtful comment. It’s given me a lot to think about, and I’ll definitely be coming back here to read it, and think about it, again.